American historian Deborah E. Lipstadt has made Holocaust scholarship her life's work. 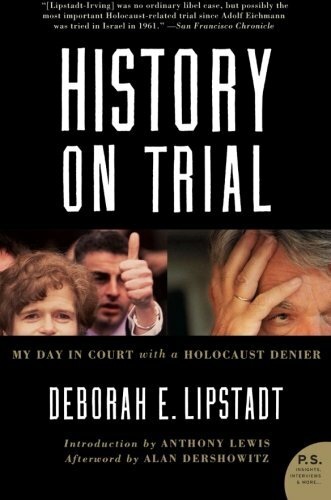 The Dorot Professor of Modern Jewish History and Holocaust Studies at Emory University, Lipstadt is the author of Denying the Holocaust, History on Trial: My Day in Court with a Holocaust Denier, and The Eichmann Trial. 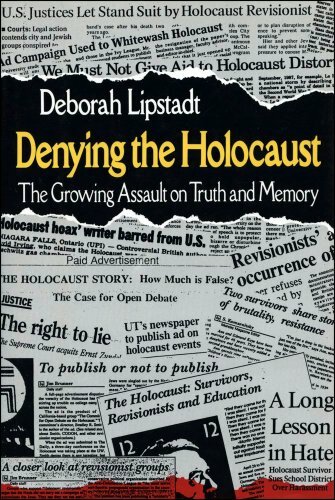 In 1996, Holocaust denier David Irving filed a libel lawsuit against Lipstadt and Penguin Books, the publisher of her first book. The resulting trial is the subject of a new film, Denial, which is now screening in select theaters. Q: Tell me a little about how the film, based on your libel trial and book History on Trial: My Day in Court with a Holocaust Denier, came to be made into a film. (l to r) Actor Rachel Weisz and Author Deborah E. Lipstadt on the set of their film DENIAL, a Bleecker Street release. A: It was two producers from Hollywood who approached me about eight years ago with the idea of a film. You know how many ideas get talked about for a film, books get optioned, screenplays get written and they never become films. So, when they spoke to me I was a little bit nonchalant about it. I didn’t think anything would come of it. And then when they got more serious and wanted me actually to sign the option on my book, essentially the green light for at very least going ahead with trying to find a production company and get a screenplay written, I said to the two producers Gary Foster and Russ Krasnoff, this is a story about truth. I know that when you make a film you have to take certain liberties, but you can’t take liberties with what happened. You can’t take liberties with the truth. You can’t jazz it up, because then the movie will be in contradiction to what the story is about. I’m very pleased that not only did they stick to their word, but they found two production companies, Participant [Media] and BBC Films, who both understood that. They brought in David Hare, probably one of the most exemplary screenwriters of our time, and he understood that immediately. And the actors [understood that too]. Everyone got it and understood that this had to be as realistic as possible. Q: Was writing the book or making this movie cathartic? A: It was cathartic for a number of reasons. It was cathartic because during the trial and during the lead-up of the legal battle, I had to keep silent. First of all, they felt that publicity was not in our interest. In the beginning, we were hoping that David Irving would drop the suit. You never want to go to trial because it’s such a long, tedious, arduous, and expensive proposition. We figured if we denied him the oxygen of PR, of public attention, he would be more likely to do that. We knew that if anybody interviewed me, the next place they’d go would be to interview him and that would just ramp up the chances of the suit not being dropped. So I didn’t talk to the press, even though the press was chasing me down. I kept silent, and during the trial I wasn’t giving testimony. It’s the right of the defendant not to give testimony in libel trials. And the lawyer said, “Look, you’re being sued for what you wrote in your book. There’s nothing you can add by going on the stand. The book is your voice, and we have to prove that what you wrote is true. Why should we put you on the stand?” Which of course frustrated David Irving to no end, it seemed to me. But then they felt that if I wasn’t giving testimony in the court, I shouldn’t be talking to the press outside the court. So I kept quiet and that was an act of self-denial. Hence the title of the movie has a double-entendre, double-meaning: denying the Holocaust and also that a very articulate person whose main tool is her brain and her mouth had to keep silent. Q: How did it feel when they told you that they didn’t think it would be best for you to testify? Did that feel insulting? Did it make sense? A: It was a little bit insulting. I said, “Oh they don’t think I’m good enough.” What bothered me—and this is very much translated into the movie—[was] that people would think I was a coward. The thought of being thought a coward in the face of this awful man who was so filled with hate, anti-Semitism, misogyny and racism was very hard to accept. I fought with the lawyers a lot about it but eventually I understood they were right and I was wrong. It was the right strategy. Q: In the film, your character says: “When someone comes after you, you take them on.” That attitude, that aversion to cowardice, is so brave and frankly very American, and then your birth name, Devora, means “defender of her people.” Do you think that fearlessness is something that a person is born with, or can it be nurtured? A: Devora, Deborah the Prophet, was a defender of her people. Actually, ironically the word itself means “bee” and bees can give honey or bees can give stings. But I was very much named after Devora and my mother had the prophetess in mind, a defender, a strong person. I was told that from childhood, and maybe that shaped who I am. I don’t know. But I also came of age with the feminist movement and one of the musical themes of my life is a song that some may remember, by Australian singer Helen Reddy, "I Am Woman (Hear Me Roar).” It was just, I am who I am, you know? I didn’t feel like I had to go out and find fights, but I felt very strongly that if something was wrong, you had to do something. I don’t think I was raised to be a troublemaker, but I was raised to be very confident in my voice and confident in who I am as a person, as a Jew, as a woman. Those things were never separate. It’s all a part of the complex makeup of my DNA, so to speak. So when David Irving came after me, and people said to me that I shouldn’t fight, that I would cause more problems, I felt that’s not who I am. I felt I had to take him on. I had to take him on not to show I’m stronger, nothing like that. Because of the nature of British libel law, if I hadn’t fought, he would have won by default because the burden of proof is on the defendant. If he had won by default, it would have been noted that Deborah Lipstadt libeled him by calling him a Holocaust denier, ipso facto, he’s not a Holocaust denier and his version of the Holocaust is considered a legitimate version: there was no mass killing of the Jews; Hitler didn’t have anything against the Jews; there were no gas chambers; Jews made this up in order to get a state and to get money; all sorts of crazy notions like that. That was really what propelled me to fight and not pride. Q: One of the things the film depicts is that the trial relied on hard evidence and didn’t even call on survivors to testify. There’s a scene showing the visit that you and your defense team made to Auschwitz. Your character, who is understandably pretty emotional in that moment, is told by her barrister: “This isn’t about memorializing. It’s about forensics.” Was that painful to consider? I imagine it was a real struggle to look at the trial that way. A: It was an awful moment. The visit to Auschwitz was very difficult. It wasn’t my first time, but [at the point] I had the fight, as depicted again in the film, I didn’t know my barrister Richard Rampton well. He’s now become a very good friend. He’s a very sweet, sensitive man and he was just wonderful, but I didn’t know him and I was very nervous. I was scared. I didn’t know how this whole thing would evolve and I misunderstood what he was doing at Auschwitz in terms of preparing the witnesses. I thought he needed to be convinced that the Holocaust really happened, which is a terrible miscontrual of what was going on, but I think it showed how my emotions clouded my intellect. One of the reasons we won this trial and won so conclusively is because we didn’t make it about memorializing. We fought a forensic battle of the first order. We followed the footnotes back to the sources, and we let the facts speak for themselves. That relates to Holocaust education in that you don’t need to memorialize when you’re teaching students. You don’t need to get emotional as the teacher and tell them it’s a horrible thing. If the students can’t understand it’s a horrible thing, can’t understand the responsibility that comes out of knowing about something like this, then nothing you’re going to tell them is going to make a difference. We let the facts speak for themselves, and that should be some source of comfort to people who worry what will happen when the survivors are all gone. The facts are there and they speak for themselves. Q: Female academics are seldom portrayed in movies, and when they are, their accomplishments are often minimized or presented as mere background. How do you feel about your portrayal in this film—and by the stunning Rachel Weisz no less—who I understand you worked with pretty closely? A: One of the great unexpected benefits was having established a relationship, a friendship of sorts with Rachel Weisz. You know at dinner parties, how we sometimes discuss who will play me in the movie [of my life]? I just hope and pray if you’re ever portrayed in a movie, that the actor who portrays you is of the same acting abilities as Rachel Weisz. Rachel has wellsprings of acting talent and of humanity, of menschlichkeit, of being a human being. I am thrilled with her portrayal. I am really very, very grateful [for] the way she reached out to me. She wanted to bring me into this process of her creating this character “Deborah.” She didn’t do it to be nice to [me] or make [me] feel part of it, but because that was part of her research. She’s a professional in that way. Think about some of the major motion pictures about women, Erin Brockovich, Norma Rae, and Rachel did a wonderful film called The Whistleblower about a Midwestern police woman who uncovers a prostitution ring in Bosnia and Herzegovina being run by UN officials. The [characters] discover their voice in the course of their battle. Here I had a voice. I used it. I taught. I wrote. I lectured, not on as wide a scale as I’m doing now, but still I had that voice and I had to suppress it. It was the right thing to do and sometimes it’s okay to remain silent, but use your voice before and use your voice after. At the press conference at the end of the trial, someone said that I carried myself with such dignity, and I said, “I just kept quiet.” If that’s dignity, I don’t know, but I just kept quiet. But I’m not going to keep quiet anymore.